Swansea Hockey is wrapping up its 35th season, and it's the season that almost wasn't. MasterCard Canada's generous donation at the last moment saved this season from cancellation as the city was delaying the opening of outdoor rinks until January. Thankfully, the show went on and it got me on skates regularly for the first time since I was a 12 year old playing Swansea Hockey at this same Rennie Park. 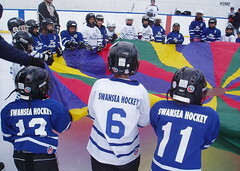 The Swansea Hockey Association might be the best kept secret in the city. 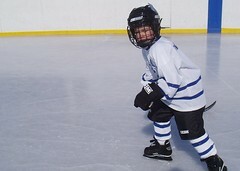 It's affordable and accessible outdoor hockey and both James and I had a blast this season. Today was our last Learn to Play Hockey clinic so I brought my digital camera along to take some shots. Little did I know the surprise that was in store for these four, five and six year olds. 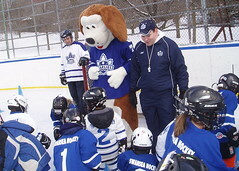 The Toronto Marlies sent a squad to Rennie Park to entertain the kids, and this team included the very popular Duke the Dog. My son loves this guy, and he was seeing him again today for the third time in less than a month. It was a fantastic morning and I can't wait for another season of Swansea Hockey. Here are a few shots. The whole shebang is in this photoset.